Happy Hump Day! I FINALLY wore my new cold shoulder top from the one and only Target and am IN. LOVE. I bought this top when I first moved because 1.) I needed more clothes because I got rid of most of mine 2.) I needed a pick-me-up. I love this top because it is on trend but also a really great staple piece! I have so many ideas on how to wear this. With this look I kept it pretty basic for running errands, but this top could easily be worn for any occasion. OH! While shopping for this top I came across these great earrings that remind me of a favorite pair I used to own for many years that I lost on a night out. They are the kind of earrings I wear when I don’t know what to wear and I happen to be wearing black. I couldn’t beat the price so Target won again…. 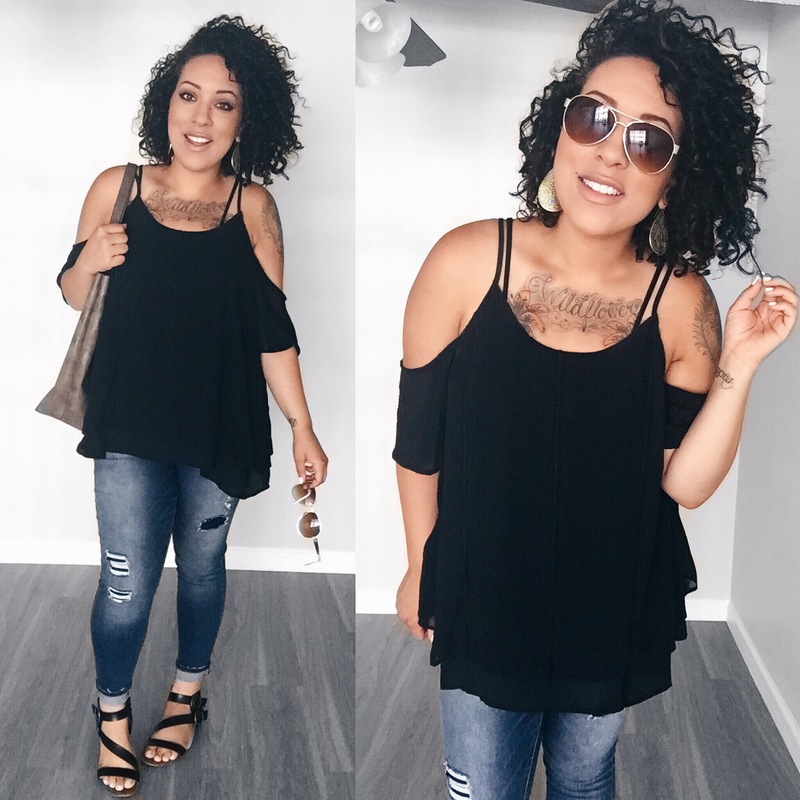 These high waisted jeans and loose fitting top are magic! This top is great for us this season. It hides the arms in all the right (or wrong!) places and is something on trend that actually works for our bodies. I love how flowy and elegant the top is and can be worn casually or dressy. I went with a size up in this because I wanted an extra flowy boho look in addition to extra tummy coverage. I can’t WAIT to share all the different ways to style this top with you all.